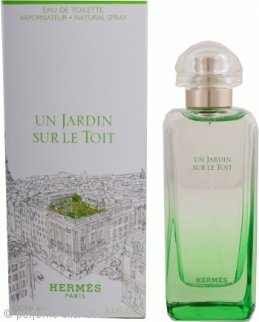 Un Jardin Sur Le Toit refers to the especially luxurious garden located on the Hermes’ headquarters building roof at 24 Rue Faubourg Saint-Honore in Paris. The garden is full of aromatic herbs, flowers and fruits whose flavours vary as they pass through the metamorphosis induced by the seasons. Its fresh and sweet-smelling atmosphere is captured by apple, pear, rose, green grass, basil, magnolia and compost notes. Un Jardin Sur Le Toit by Hermes was launched in 2011.